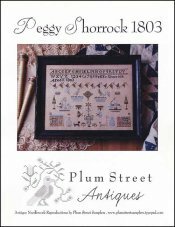 Peggy Shorrock 1803 [D6615] - $18.00 : Yarn Tree, Your wholesale source for cross stitch supplies. An antique needlework reproduction. Stitch count 190w x 136h. Stitched on 36ct Linen.